From the archives of Sister Cities International and the extensive submissions of stories and photographs from dedicated members around the world, this beautiful keepsake volume documents, for the first time, the rich and colorful history and powerful reach of the global sister city movement, which has established meaningful partnerships and built one-on-one cooperations between U.S. and international communities for the last half-century. Delve into this limited edition, commemorative book and be inspired by hundreds of stories and photographs from outstanding sister city programs around the world. 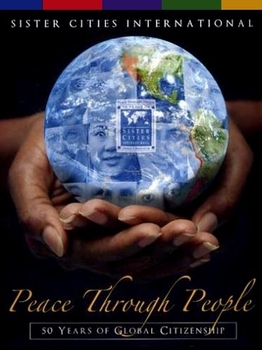 Peace Through People celebrates the spirit and the now 50-year history of this citizen diplomacy movement, which President Dwight D. Eisenhower founded on September 11, 1956. Heartwarming, encouraging, and empowering, this volume illuminates the passion and the power of our global community.